Bernard Łubieński was born in Guzów, near Warsaw, Poland, on December 9, 1846, the second son of 12 boys born to the nobles Tomasz and Adelajda Łempicka. As an adolescent he showed the desire to become a priest, and in 1858 he was sent to study in England. Thanks to the favorable influence of the educational environment of St. Cuthbert College in County Durham, England, he received tonsure in 1862. On September 7, 1864, he entered the Congregation of the Most Holy Redeemer. 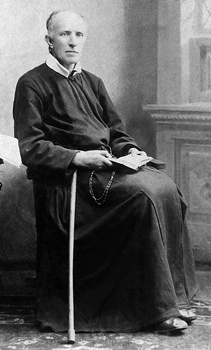 On May 7, 1866, he professed religious vows, and he was ordained a priest in Aachen, Germany, on December 29, 1870. He remained in England for 11 years, carrying out the missionary activity and helping the Provincial Superior as secretary. In 1883 he returned home to collaborate actively in the re-foundation of the Congregation in Poland. The first houses founded in Mościska, Kraków, and Warsaw immediately became the centers of his intense apostolic activity. For 15 years he was superior in the house of Mościska, at the same time taking care of the formation of the young missionaries who attended the “second novitiate” in preparation for the popular missions. Despite a serious paralysis of the legs that struck him in 1885, he continued his intense apostolic activity. Over the course of his priestly life he preached more than 1,000 missions and retreats. Announcing the Word of God, he travelled all over Poland, going all the way to Germany, Ukraine, Russia, and Finland. He strove tenaciously for the union of the Orthodox Church with that of Rome, and in 1908 he was considered a possible candidate for the episcopal see of Mohylew, in Russia. He wrote numerous religious books and articles. A great promoter of devotion to the Blessed Virgin, he wrote a story of the Icon of Perpetual Help, spreading the devotion throughout Poland and bringing from Rome more than 70 copies of the Icon for veneration in parish churches. In his fervent apostolic activity, he was animated by a solid faith and a solicitous charity, perfected by a continuous relationship with God. Working constantly and with care over his usual nature, he developed a marked humility and a serene religious obedience. Because of these characteristics, he was highly esteemed by the people who relied on his spiritual guidance. Worn out by his apostolic activity and fatigued by disability, he died peacefully on September 10, 1933, in Warsaw, where rest his remains in the Church of St. Clement Hofbauer.